With the rise of the Internet, and the wide availability of “beta” software (nearly everything Google releases, for instance, is tagged “beta”), we’ve all come to expect betas to be relatively polished and usable products. That typically holds true with The Mozilla Organization and Firefox. Betas of the popular Web browser are highly publicized and widely downloaded without much thought given to the fact that the software may still be a work in progress. We do not recommend that anyone other than developers and testers download the Firefox 2 Beta 1 milestone release. It is intended for testing purposes only. Clearly I’m not a developer, but I was interested in seeing what changes and new features are slated for Firefox 2, so I decided I qualified as a tester, since I’m more than willing to crash my machine in the pursuit of knowledge. With that decision made, I downloaded the Universal Binary beta, installed it, and set out to see what’s changed with my second-favorite browser (behind Camino ). While there’s a lot to like about this version and my experience has been pretty stable so far, I would caution anyone who’s contemplating using the Firefox 2 beta that it’s not in any way yet recommended for production machines. Each tab now has its own close button, instead of one global close button at the right edge of the tab bar. When you’re loading a page on a tab, the spinning “site loading” icon no longer overwrites the site’s icon at the left edge of each tab. Instead, the site loading icon is placed just to the right of that spot. The Extensions and Themes entries in the Tools menu have been combined into a new Add-Ons item. The Add-Ons interface itself now has tabs for Extensions and Themes, which is a much more logical structure. If you use extensions and themes, you’ll probably find that the vast majority of those you’ve installed in 1.5 don’t yet work in the 2.0 beta. In my case, only 9 of my 25 extensions, and none of my 10 themes, work in Firefox 2.0. (There are some themes available that work in 2.0, such as Phoenity Modern and NASA Normal.) But this is a standard issue with any major Firefox release—it’s always a bit of a wait until the themes and extensions catch up. Keep in mind this is but the first beta of 2.0 as well, so it’s quite early in the process. So if Firefox looks the same as it predecessor, and seems to have few visible changes, why bother with a version jump all the way to 2.0? To answer that question, we must look a little deeper. While the Firefox 2.0 beta looks nearly identical to its 1.5 predecessor, there actually are a fair number of new features of interest to the typical user. Here’s a quick look at some of them, based on my testing with the 2.0 beta 1 release. Because phishing sites change rapidly, Firefox’s list of sites is updated “regularly,” though at this early beta stage, there’s only a limited list of sites. Future beta releases will include a longer list, as well as an easy way to report both additional phishing sites as well as false positives (valid sites that have been flagged as phishing sites). 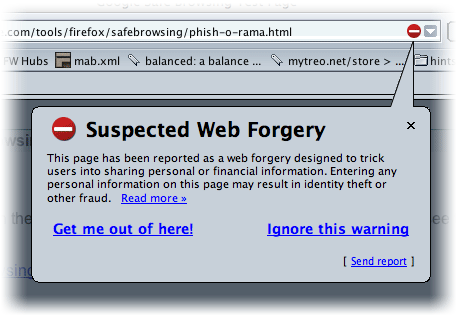 For now, then, the anti-phishing feature is in the “soon to come” category. But with the increasing sophistication of phishing emails, the final version of this tool will be most welcome. Spell Check: Firefox will now spell check words in text fields, as you type. When you type a words the browser can’t locate in its dictionary, it gets flagged with a dotted underline. Control-click on the underlined word, and the contextual menu will offer replacement words, as well as the ability to add the word to the dictionary. What’s lacking, at least as of beta 1, is the ability to simply ignore a word, instead of being forced to add it to the dictionary if you don’t want to change its spelling. While I’d much prefer Firefox to simply use the built-in OS X spell checker, this solution works (though it does mean you’ll be maintaining two dictionaries, one for OS X apps and one for Firefox). Search enhancements: There are two main improvements in search. The first is that the search box is now customizable. Click the drop-down arrow next to the magnifying glass and select Manage Search Engines. When you do so, a small drop-down box appears, letting you reorder the list of existing engines, as well as add or remove other search engines. Unfortunately, you can’t define your own search engine, at least in this beta release. Instead, you’ll have to pick from a list of Mozilla-provided engines, which you reach via a URL link in the Manage Search Engines box. Hopefully future releases will allow easy addition of your own search sites. The other improvement in search is the new “search suggestions” feature. As soon as you start typing your search term, Firefox opens a list of possible search terms, based on what you’ve typed so far (as seen in the image on the right). 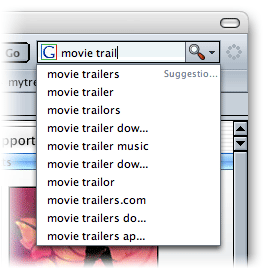 At the top of the list are any searches from your search history; below that are matches based on what you’re typing. In testing this feature, I found that my search term often wound up near the top of the list after only a few characters of typing (even when not retyping something that was already in history). This little feature could prove to be quite the typing timesaver. Session Restore: If Firefox crashes, it will now reopen tabs, resume downloads, and bring back any text you had typed in forms at the time of the crash. This worked well when I tested it (by force-quitting Firefox). However, you’re also supposed to be able to reopen accidentally-closed tabs or windows, and I couldn’t figure out how to do that (without resorting to History, which has always worked in most any browser). For more robust session saving, however, I still rely on the SessionSaver add-on, which has a few more features. (And it’s already updated for the 2.0 beta). Bookmark microsummaries: Typically, bookmarks are stored with either the title of the page they refer to, or a name the user creates for that bookmark. Firefox 2.0 adds a third naming method, microsummaries. A microsummary is a dynamic title for your bookmark, set by the site you’ve bookmarked. So instead of seeing Merriam Webster Dictionary Word of the Day for your bookmark title, you can actually see the word of the day—and it will change each day. For this feature to work automatically, you must first install a microsummary generator for a site (and the site must, obviously, have a generator available). Then, you bookmark it and click a pop-up field in the bookmark entry screen to change the name to the micosummary. After playing with this for 30 minutes or so, I still don’t get it—why would I want the name of my bookmarks to change regularly? Besides, at least as of this beta, the microsummary name doesn’t show in the Bookmarks menu; only on the Bookmarks screen, or in the sidebar. Thanks, but I think I’ll stick with the traditional method of naming bookmarks. Perhaps in later betas, this feature will become more impressive. For now, it’s not something I plan on using. In Firefox 2, when you visit a site with a feed and then click the feed icon in the URL bar, you’ll get a nicely-formatted presentation of the feed’s contents, as well as options for how to handle the feed (use a live bookmark in Firefox, use an external reader, and so on). This is a nice improvement over the current browser, which merely creates a live bookmark when you click the feed icon in the URL bar. As you’ll recall, the Mozilla group doesn’t recommend Firefox 2 beta for most users. Despite that warning, however, I didn’t experience a single crash during testing, and most features were functional. There are definitely some rough spots—I couldn’t get Command-W to close the last window, for instance, and the help files have yet to be updated. But such things are to be expected in an early beta; I was actually surprised that I didn’t have more troubles with the program. For heavy users of Firefox’s numerous extensions and themes, the lack of compatibility will probably be a show stopper. But as a portent of things to come in the final release of Firefox 2, this first beta is a good sign. Overall, though, I was impressed with the stability, feature set, and general performance of this first public beta. It will be interesting to watch as Firefox 2.0 evolves from this first beta to a released version sometime later this year.